Symphony no. 1, in C major, op. 21 seems simple at first sight, even too simple if we compare it to his last symphony. 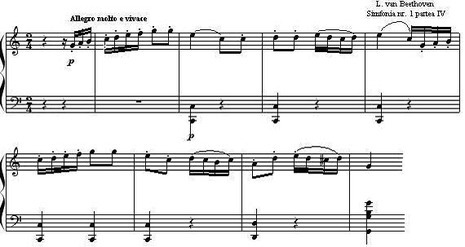 Remarkable in this sense are Robert Schumann’s reflections written three years after the composition of this symphony, reflections triggered by the listening of Symphony No.IX: " Love him, love him truly, but do not forget that he reached poetic freedom after thorough study, years on end, and praise his restless moral power. Do not seek to extract the unusual, go back to the roots of creation, demonstrate his genius not through his last symphony (…), you can do this just as well through his first symphony." Even if this work marked the debut of a composer in a genre that appealed to him, it did not bring anything radically new, if we consider the creations that the world had admired up to that point. One of that time’s commentators observed: "If we now see only the claw which harbingers the appearance of the lion, it is because the lion found it wiser not to attack just yet." Beethoven was nearly 30 years of age before he completed his First Symphony. He clearly thought about it long and hard; he knew he would be judged on it. It was, if you like, a statement of intent. Sure enough, from the very first note, it is pure Beethoven. He begins it in a totally unconventional way – three sets of rising chords. Already he is breaking the rules.